A naughty but nice treat to pop into one’s mouth! 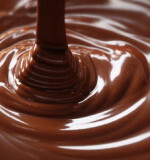 Melt chocolate over a double boiler. Take off heat. Add cream, rum and vanilla to the melted chocolate and stir in. Pour the ganache into a tray and allow to set. Using a teaspoon, create a small ball by rolling the ganache with the palms of your hands, and then dip it into the tempered chocolate. To finish, roll the truffles in finely chopped nuts.